We’d love your help. Let us know what’s wrong with this preview of The Ology by Marty Machowski. A Companion The Ology CD from Bob Kauflin and Sovereign Music will also be available. Check out this preview! To ask other readers questions about The Ology, please sign up. Does this book have illustrations of any Persons of the Godhead? Several years ago, I was introduced to the writing of Marty Machowski through The Gospel Story Bible. The illustrations were a bit loud for my taste, but the writing and the scripture coming across was solid and good for sharing with my children (who do appreciate the wild drawings). Then in the last year I discovered Long Story Short (a devotional) on Kindle. I'm hoping that one day I will also find Old Story New go on sale there as well. Now when I saw that a new book, The Ology was coming out I had to jump for an opportunity to review it. I'm so blessed that I am able. Little background, c'est moi. One of my degrees is a bachelor of arts in religious studies. Thus, I have read a lot and I definitely want my children to read something that can explain what others believe so they can build upon it. In our homeschool journey, I have looked at materials, but most worldview curricula start for older children than my own. It seems at this stage the best you can do is read a story-book Bible and discuss it. I grew up in the United Methodist Church. The Enginerd grew up a combination of Presbyterian and LCMS Lutheran. As a married couple, we've been members of both a WELS Lutheran and United Methodist Church with our own Catholic leanings. Last year we did use Seton Religion 1 and loved it, but the program ended up being too expensive to continue and we didn't love the rest of the enrollment program and decided to go a different diploma route. Now we are in a Bible class of sorts, but it is purely Bible history and not so much prayer, and self-action, as one might find in a catechism. Also, we haven't turned to just a catechism as they tend to be too dry for the littles. So now what? Well! that's where The Ology comes into play! If you're going to be a parent who sits and reads to your children anyway, why not sit and read a bit of theology to give them something to build upon. Through this book, anyone can learn the basics of a Christian theology. The illustrations in this book are lovely, but beyond that Marty also uses word-pictures that help to truly make the story visual for kids to get an understanding of theology. Who said, "you're too young for theology"? That's not the case anymore. As a parent, you might have had to scrap together a curriculum before but building on The Ology the hard work and children aligned speech is already set up for you! Theology of God. Theology of People. Theology of Sin. Theology of the Promise and the Law. Theology of Christ. Theology of the Holy Spirit. Theology of Adoption into God's Family. Theology of Change. Theology of the Church. Theology of the End Times. Theology of God's Word. As The Ology is designed for six-year-olds through preteens, this flexible resource incorporates many built-in arrangements for use with younger or older children, so that entire families can enjoy it together. Read The Ology to preschoolers, read it with grade-school kids, and let older kids explore the “hidden” truths by reading the analogous Scripture passages for each section. No matter however you read it, The Ology will grant your children a gift that will endure a lifetime—a solid foundation to build upon of life-changing Biblical accuracy that will point them to the God who loves them and gave himself for them. Perhaps one of my favorite things is that this is not a read once-and-done-book. Yes, you can take your time going through it introducing and teaching your children these theological concepts within the systematic theology which Marty has laid out. But there is more... You can go back through it again and turn it wholly into a Bible study. Each image within the book has a handful of scripture references added to the image, which add to the lessons being taught. My 5 year old son and I read this last year for homeschool and really liked it. The pictures are beautiful, weird and thought/conversation provoking. The idea of exposing kids to deep theological concepts usually thought of as well beyond their years so clicks with me because it gives us the same language and vocabulary to use within our family. This books stays true to orthodoxy and presents biblical ideas in an engaging way. What an absolutely lovely collection of theology written on a child's level. In fact, adults may discover their own understanding of spiritual truths are sharpened by its simple presentations and profound explanations. Finished this tonight with my kids. What a great resource to introduce children to systematic theology and the doctrines of God's Word. Each chapter is short, the illustrations are great, and the content is excellent. If you are a parent with young kids, definitely check this out! Loved reading this to my 8 and 10yo boys. Good discussions, and they frequently wanted more than 1 reading per night. Explains truths of the Bible to children in a form that easy for children to understand. My five-year old and I loved this book! This is basically systematic theology for kids. It can be read like a reference book, but also enjoyed during story time! I would definitely recommend it for kids 5 and up!! This is a great book to teach our children the basics of Theology. I found lots of interesting information that they could use to better understand the Bible and all that it teaches us. In the beginning of the book we are introduced to two characters by the names of Carla and Timothy. The two children come across a box with an interesting note attached. The note reads that the box contains a rare children's book with a long history and so begins the children's quest to see exactly what this book is all about. Complete with scripture The Ology teaches your children so many things that I'm sure they didn't even know and maybe a little bit that the parent didn't even understand. So it is a great book for the whole family to use use and learn from. It opens the Bible up to you in a whole new way. with over two hundred pages and very muted, simple illustrations The Ology will provide lots to talk about at the dinner table. 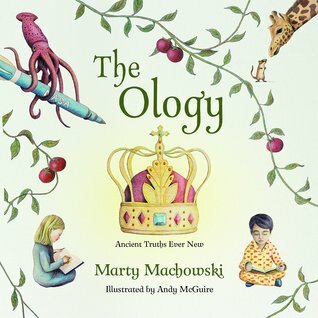 The Ology – Ancient Truths Ever New is a theologically sound primer that introduces children between the ages of 6 and 12 to core Christian doctrines and abstract theological concepts. The Ology uses creative examples, illustrations and analogies to make these concepts easy to understand. 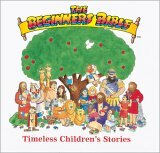 The book is written so that it’s adaptable to the wide range of needs of the children within that age group – for example, you can read the stories aloud to younger children, and older children can research the The Ology – Ancient Truths Ever New is a theologically sound primer that introduces children between the ages of 6 and 12 to core Christian doctrines and abstract theological concepts. The Ology uses creative examples, illustrations and analogies to make these concepts easy to understand. The book is written so that it’s adaptable to the wide range of needs of the children within that age group – for example, you can read the stories aloud to younger children, and older children can research the corresponding Scripture passages within each section. The entire framework of The Ology is built around an engaging story that sets the framework for the lessons that follow. The Ology is a unique treasure of a book that parents and children alike will treasure for years to come! Complex theological thoughts should not be skipped when discussing God and Christianity with children. This book, loosely based on Wayne Grudem’s books Systematic Theology and Bible Doctrine, brings big concepts like God’s character and attributes as well as the doctrines of sin, salvation, and the church to a child’s level. Using pictures (by illustrator Andy McGuire) and examples, Machowski brings theological concepts to a level that early elementary children can comprehend. Each page features Complex theological thoughts should not be skipped when discussing God and Christianity with children. This book, loosely based on Wayne Grudem’s books Systematic Theology and Bible Doctrine, brings big concepts like God’s character and attributes as well as the doctrines of sin, salvation, and the church to a child’s level. Using pictures (by illustrator Andy McGuire) and examples, Machowski brings theological concepts to a level that early elementary children can comprehend. Each page features one or more Bible verses, an illustration, a discussion of a concept (e.g., God keeping His promises), and multiple references to further investigate what God’s Word says about the concept. First sentence: Exploring the centuries-old church in their neighborhood was proving to be an adventure that Carla and Timothy would not soon forget. They had come upon an unlocked cellar door and had ventured down the stone stairway into the musty dimness below. "Look!" Carla exclaimed as she lifted the corner of a thick rug. "A hidden door." "I wonder where it leads," Timothy said. "Does it open?" the children pulled back the rug and lifted the door. Timothy pointed his flashlight into the dar First sentence: Exploring the centuries-old church in their neighborhood was proving to be an adventure that Carla and Timothy would not soon forget. They had come upon an unlocked cellar door and had ventured down the stone stairway into the musty dimness below. "Look!" Carla exclaimed as she lifted the corner of a thick rug. "A hidden door." "I wonder where it leads," Timothy said. "Does it open?" the children pulled back the rug and lifted the door. Timothy pointed his flashlight into the darkness revealing a stairway to a room beneath the church cellar. Premise/plot: You might assume that The Ology is just another bible story book written for parents to share with their children. It is true that this one contains a few familiar bible stories: Adam and Eve, Abraham, Moses, etc. But The Ology is not a Bible story book. (Though it is biblical.) In seventy-one short chapters, The Ology presents a systematic theology appropriate for families with children of all ages. The framework. The book opens and closes with Carla and Timothy. In the beginning, these two come across a book, The Ology, that has been hidden in the secret room underneath the cellar in an old church building. They begin to read the book together. At the end, Timothy and Carla decide to take the book home with them to reread it. The next time they read it, they will read it with the Bible as well. The book consists of eleven parts: "The Ology of God," "The Ology of People," "The Ology of Sin," "The Ology of the Promise and the Law," "The Ology of Christ," "The Ology of the Holy Spirit," "The Ology of Adoption into God's Family," "The Ology of Change," "The Ology of the Church," "The Ology of the End Times," "The Ology of God's Word." Some sections are really short. Some are much, much longer. The shortest section is "The Ology of People." Perhaps this section reads the most like a traditional Bible story book. Overall, there are twenty chapters on God when you combine the chapters on God the Father, God the Son, and God the Holy Spirit. My thoughts: I am so thankful that my library was able to interlibrary loan this one. I've been meaning to read it since it first came out. I definitely love the idea of loving this one. I think it is so important to teach and instruct children in the faith from a very early age. Christianity isn't just a feeling; there are truths that need to be taught, need to be learned. You don't learn biblical truths by accident. They need to be intentionally taught. Otherwise, you'll pick up "truths" as you go, as you watch people around you, as you float in and out of churches growing up. And sometimes the truths you pick up "by accident" are more half-truths than whole-truths. Each theological truth has its own chapter. Each chapter has several scripture references to look up and read. The parents guide urges parents to choose a memory verse for their children to learn to go with each chapter. The illustrations are supposed to engage readers and provoke conversations and discussions about what it means. Each chapters has at least one analogy to make the theological concept easier to understand. My favorite section was "The Ology of Adoption Into God's Family." The chapters: "Chosen," "Called," "Born Again," "Faith," "Jesus Paid it All," and "Adopted." Imagine going to an ice cream parlor on a hot day to buy an ice cream cone. The hardest part is trying to decide which flavor to get. Some people love chocolate and will only choose ice cream with chocolate in it. Others enjoy big, chewy chunks of candy in their ice cream. But what if you went into an ice cream shop and none of the flavors had any appeal. Imagine flavors like stinky sneaker, mildew swirl, and earthworm chunk? You would most likely leave the shop without getting anything. We choose ice cream that tastes good. But when God chose us to be a part of his family, we were yucky, spoiled sinners--not one of us was good. God didn't choose us because he needed us or because we had some special quality, God chose us while we were still sinners, just because he decided to love us. After Adam and Eve sinned, they hid from God. We do the same thing when we sin--we try to hide from God and get as far away as we can. Without God's help, no one would turn to him. We are all like runaway trains, speeding away from God toward a terrible crash. But because of his love and not because of anything we have done, God chose to save some who ran away. Even before creating the world, God chose his children. He knew Adam and Eve would sin, and he planned before creation to send his only Son to rescue his people from sin and death. It's good news that God chooses us, because sadly, without the Spirit changing our minds, we would never choose him! the Bible even says that we were "dead" in our sin and the Spirit has to first make us alive before we believe! Apart from God, we are helpless to choose him. We don't even like God until he breathes life into us, opening our eyes to see him. Only then, alive in Christ, do we choose to follow God and live for him. Scripture references: Romans 8:29-30, Ephesians 1:4, Ephesians 1:5, 1 Peter 2:9, Ephesians 2:4-5, Colossians 2:13, 1 John 1:10, Ephesians 2:1-3, John 15:16a, Acts 13:48. Fabulous resource for teaching theology to children in an engaging and beautiful way. Found myself so blessed right alongside my kids. This was a good read for Abby and I. We will read it again. I became familiar with Marty Machowski through The Gospel Story Book Bible, an excellent story Bible which is similar to Sally Lloyd-Jones’s fabulous The Jesus Storybook Bible. The Ology takes a different approach with a slightly older audience in mind. We used it for our family devotions and found that it wasn’t too juvenile for our 12 and 15 year old. Written with a biblical-theological framework, The Ology tracks the story of the Bible. 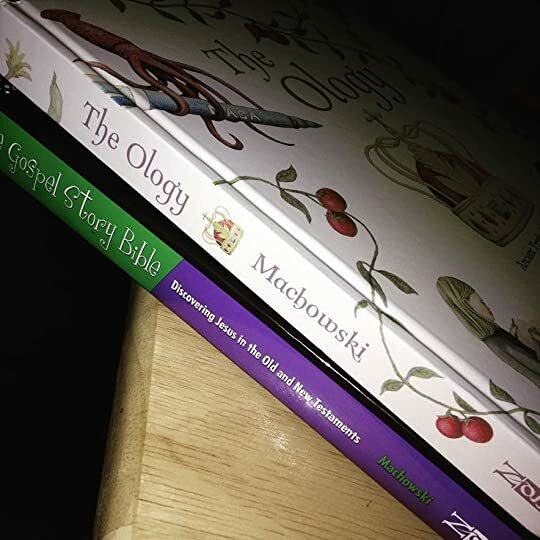 Machowski is an excellent guide in exploring foundationa I became familiar with Marty Machowski through The Gospel Story Book Bible, an excellent story Bible which is similar to Sally Lloyd-Jones’s fabulous The Jesus Storybook Bible. The Ology takes a different approach with a slightly older audience in mind. We used it for our family devotions and found that it wasn’t too juvenile for our 12 and 15 year old. Written with a biblical-theological framework, The Ology tracks the story of the Bible. Machowski is an excellent guide in exploring foundational doctrine such as sin, salvation, and heaven with everyday examples and simple language that kids can understand. This book was very helpful to me in understanding things like the trinity, the 10 commandments, and the promise to Abraham. Things are very well explained by little passages exploring different concepts as in Jesus Christ and sin. The pictures in this book give you a vivid picture in your head of what could have happened when it happened. It also has an intriguing story about how this book was found. Tip: you should probably have your bible to look up verses. I enjoyed the writing and illustrations in this book, and the theology was perfectly fine, but the overall structure was a bit strange. The subjects overlapped a lot, were in an odd order, and at times were too short. I also didn’t understand why there was a fictional story in the beginning and at the end. I’m sure we’ll read it again because we read a Bible story book every night with our kids, but it won’t be a favorite. 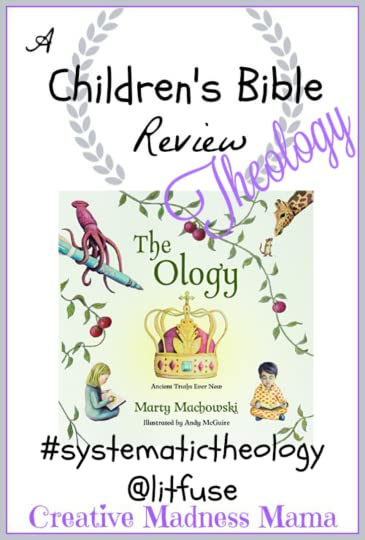 Good overview of systematic theology for children. It is easy to understand, has verses, questions, and illustrations. I would give it five stars but there were several sections which were poorly explained. The lesson on baptism added more confusion than explanation, as well as some sections of the end times. Some of those themes are confusing enough as it is, and trying to include a broad range of interpretations is pointless. When described as systematic theology for children, a book can sound dry and overreaching, but this book is neither. I learned so much from this book and so did my son. The wording using excellent illustrations, both literal and figurative, to explain very deep concepts. I would highly recommend this for kids 6 and up depending on their maturity level. Very well-thought out and cute design - though a few of the paintings looked a little funny to me. I wish the story of the children carried throughout the book a little more. I realize that is not the point of this book, but I think a child would appreciate a few caveats of the children throughout the chapters of Biblical theology . I read this out-loud to my family during our worship time at the breakfast table. It was gospel-centered and readable for kids (ages 6-preteen is recommended) but enough depth that an adult would be edified as well. I even sent one day's lesson to an adult brother who was struggling to encourage him. Highly recommended as a kids devotional or family worship time. In The Ology, children and families can access deep Biblical truths, carefully explained and gorgeously illustrated. A very cool book, but too old for preschoolers. We’ll revisit in a few years. I highly recommend this book for anyone that wants to teach children about theology. Solid teaching and beautiful illustrations! This is a wonderful book introducing or reviewing the doctrines of God for children. This is a wonderful book - captivating, Biblical, sound theology, reader friendly, engaging, visually beautiful - I can't wait to use this when I get back to work. Great book for teaching children theology. This is a good systematic theology-like book for kids. Some sections were less helpful (baptism), but for the most part, it explained and illustrated complex truths in a simple way for children.